What do you think of when someone asks about your building’s fire protection system? 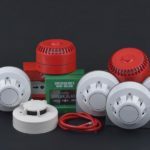 You probably think about its smoke alarms and sprinkler systems. But it is really a collaboration of the two types of fire protection systems, Active Fire Protection and Passive Fire Protection. Do you know the difference between Active Fire Protection and Passive Fire Protection? Active Fire Protection (AFP) is a group of systems that require some action in order to work efficiently in the event of a fire. These actions may be manually operated, like a fire extinguisher or automatic, like a sprinkler. 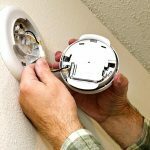 So, when fire and smoke is detected in a facility, a fire/smoke alarm will alert those who are inside the building and work to actively put out or slow the fire. Sprinkler systems and fire extinguishers are used to slow the growth of the fire until firefighters have a chance to get there. Once firefighters arrive, they use fire extinguishers and fire hoses to put out the fire altogether. Passive Fire Protection (PFP) is a group of systems that divides a building through the use of fire-resistance rated walls and floors, keeping the fire from spreading quickly and providing time to escape for people in the building. Separating your building into smaller sections helps to slow or prevent the spread of fire/smoke from one room to the next. PFP limits the amount of damage done to a building before firefighters arrive. Dampers in the building’s ductwork system prevent the spread of fire/smoke. Fire doors help compartmentalize a building, while giving its occupants means of escape. Fire walls and floors help separate the building into compartments to stop the spread of fire/smoke from room to room. For buildings with multiple floors, photoluminescent exit signs help light the way to safety in dark and smoky stairwells. Both systems need to be working together to control fires. An active fire protection system can malfunction. Sprinklers could fail due to the lack of maintenance, water supply problems like frozen pipes, or even inadequate water pressure. On the other hand, passive fire protection uses systems that help control and prevent the spread of fire/smoke. It does not, however, take any type of action, such as putting out the fire. Therefore, both AFP and PFP are meant to work together during a fire, not one in place of the other. Together they help protect lives. Call Fire Control Systems for all your fire protection needs.